Here’s a beautiful, cut slice from a stromatolite head. Stromatolites are layered structures built up by mats of cyanobacteria (= blue-green bacteria, often incorrectly called “blue-green algae”). Stromatolites are fairly common in portions of the shallow-water marine & nonmarine fossil record, but they also occur in a few modern localities (e.g., Shark Bay, coastal Western Australia). This one grew during the Eocene in ancient Lake Gosiute in southwestern Wyoming, USA. It comes from the Fort Laclede Bed of the Laney Member, Green River Formation. 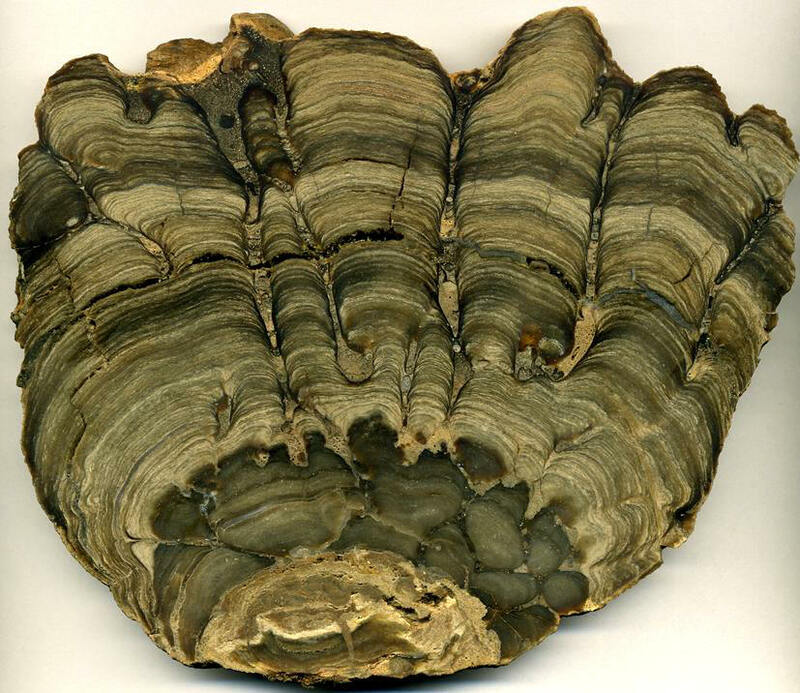 Stromatolite (18.6 cm across at its widest) from the Fort Laclede Bed, Laney Member, Green River Formation (Eocene) of southwestern Wyoming, USA. 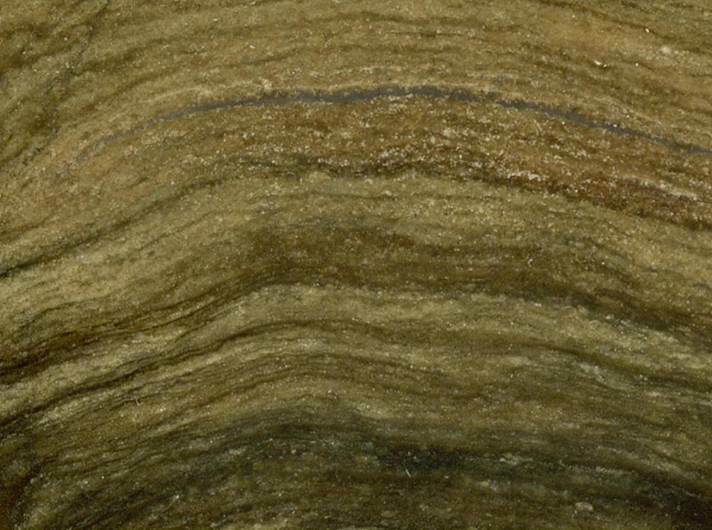 Stromatolite (~2.6 cm across; same specimen as above) - close-up of stromatolite laminations. 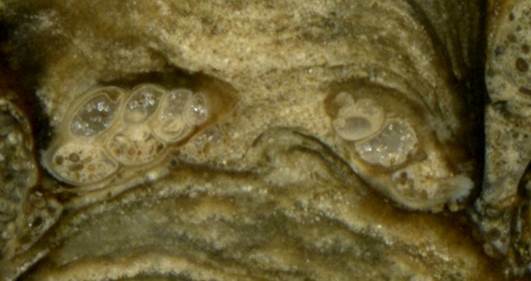 Stromatolite (~12 mm across; same specimen as above) - two lacustrine snails got caught up in pockets of the stromatolite. The snail shell on the left has oolitic & peloidal sediments filling the lower portions of its whorls & calcite spar cement filling the upper portions of the whorls - a geopetal structure. 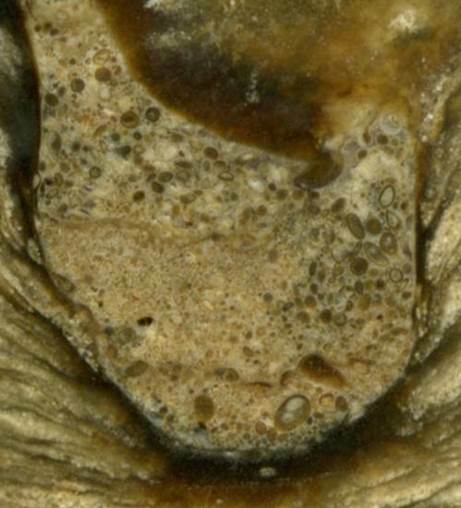 Stromatolite (~12 mm across; same specimen as above) - sediment filling between two stromatolite columns. The grains are mostly a mixture of ostracod shells, oolites, composite oolites, and peloids. Sediment pouch is ~8 mm across.